According to the great Stephen Hawking, Italian physicist and astronomer Galileo Galilei was, more than any other person, "responsible for the birth of modern science." In 1609, having seen details of a very early telescope that had been constructed in the Netherlands, Galileo designed and built his own, superior version that boasted far better magnification, and which he subsequently used to make countless discoveries in the skies. 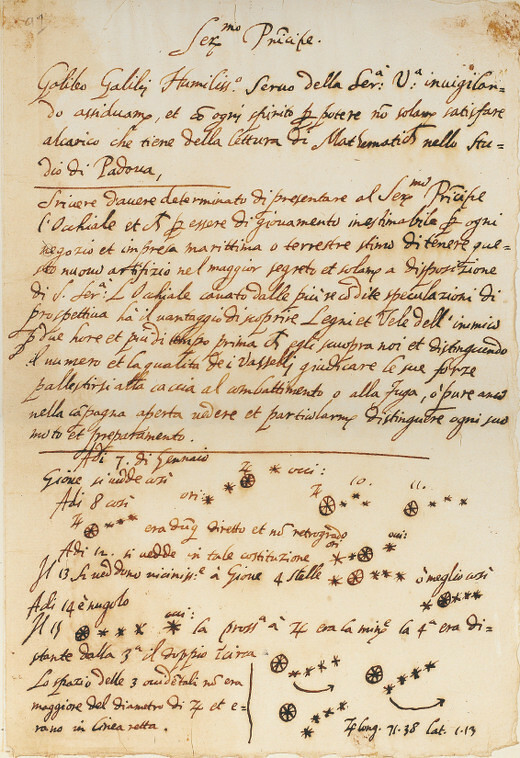 In January of 1610, he wrote a letter, the draft of which is shown here, to Leonardo Donato, Doge of Venice; in it, he describes the instrument itself and then for the first time illustrates Jupiter's four largest moons, all of which he had just discovered. Transcript follows. This letter, along with 124 other fascinating pieces of correspondence, can be found in the bestselling book, Letters of Note. For more info, visit Books of Note. Galileo Galilei most humbly prostrates himself before Your Highness, watching carefully, and with all spirit of willingness, not only to satisfy what concerns the reading of mathematics in the study of Padua, but to write of having decided to present to Your Highness a telescope ("Occhiale") that will be a great help in maritime and land enterprises. I assure you I shall keep this new invention a great secret and show it only to Your Highness. The telescope was made for the most accurate study of distances. 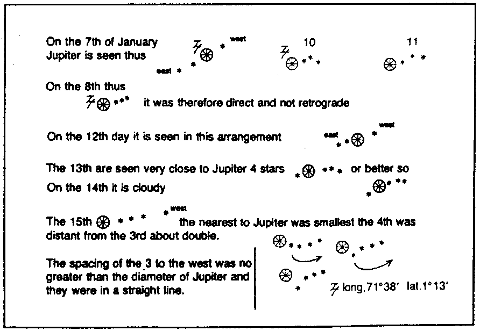 This telescope has the advantage of discovering the ships of the enemy two hours before they can be seen with the natural vision and to distinguish the number and quality of the ships and to judge their strength and be ready to chase them, to fight them, or to flee from them; or, in the open country to see all details and to distinguish every movement and preparation.